Halloween was never my favorite holiday… until I had kids. Now it has become one of the most fun holidays of the year! I mean – dressing up, getting candy, saying hello to 3,000 strangers. It is a 4-year-old’s greatest dream. To encourage the festivities, but not the spook, we are making one big ole’ party of it this year. And the costumes are my favorite part! 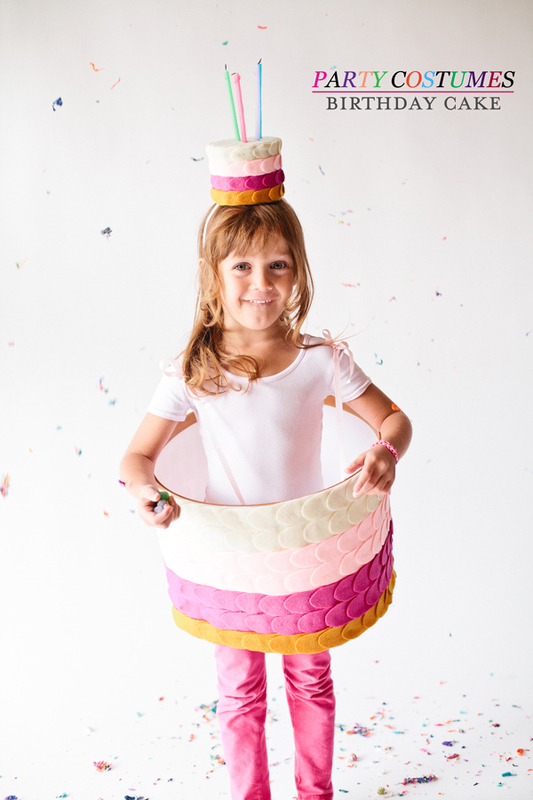 We designed a handful of festive, bright and fun Halloween birthday cakes costumes that your little ones will love – no black, orange, or spook to be found. I’m so excited to share our Halloween birthday cakes costumes – and no party is complete without starting with a birthday cake! 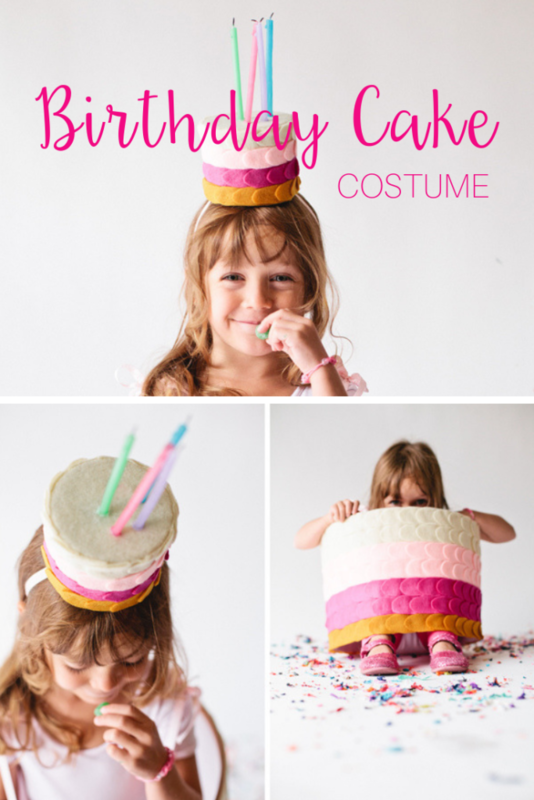 To make the homemade birthday cake Halloween costume you will need: one embroidery hoop, a piece of poster board, felt in the colors you choose, ribbon, a couple birthday candles, and a cylinder craft box. Start by gluing the poster board to the embroidery hoop (a technique you can also use to make light pendants). Make a simple leaf shape template out of the felt and use it to cut out enough felt to cover the cake base. Hot glue the felt pieces into place, overlapping as the base is covered. Glue two ribbons onto the embroidery hoop as straps for the cake base. They can be cut at the top and tied to fit your little cakes height perfectly. 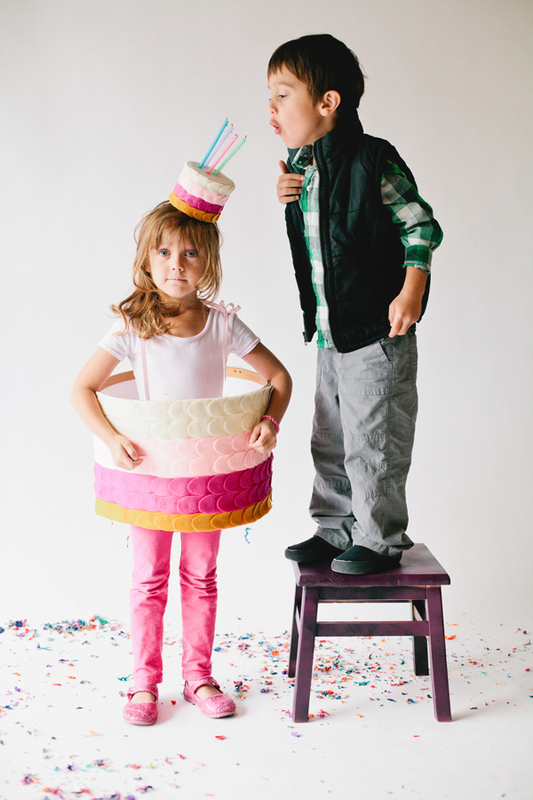 Turn the craft box upside down and cover that with the felt pieces to make the birthday cake party hat. Cut two ribbons and glue to the inside of the hat for straps. Glue the candles firmly to the top of the box to finish off the costume. Don’t light the candles… I know you will be tempted too. Enjoy the oohs and ahhs your little Halloween birthday cakes will get walking down the street. Photography in collaboration with Jocelyn Noel Photography. Your kids are the cutest! and the costume, well, it’s genius!! This is the cutest thing I’ve ever seen! Oh my goodness! That is precious!! Great idea. This is way too cute for a costume. I want to make a chandelier out of the cake and hang it in my bakery!! I can’t believe you even made it petal/ombre! Fab-u-lous! Oh my goodness, sheer genius! 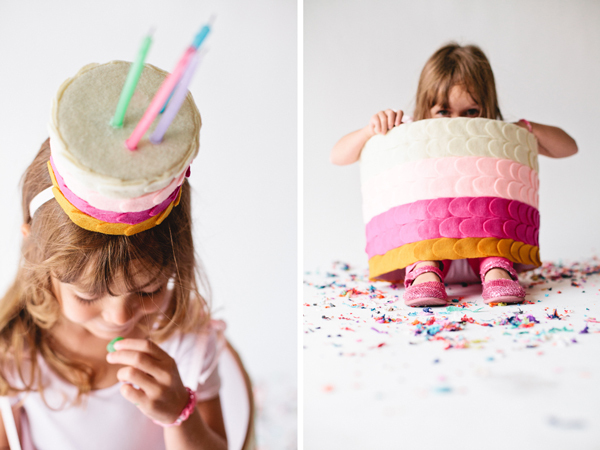 The birthday cake hat just sends it over the top! LOVE it. 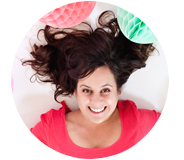 I’m with Hilary–it would make an awesome pendant light or desk lampshade.